In performing its much-discussed cost-benefit analysis on proposed regulations, the Office of Management and Budget is dangerously delaying key health and safety regulations, a senator has told newly installed White House Budget Director Sylvia Mathews Burwell. In at least two cases, the delays are one and even two years past the 90-day deadline set by presidential executive order, Sen. Richard Blumenthal, D-Conn., chairman of the Judiciary Subcommittee on Oversight, Federal Rights and Agency Action, wrote in a May 7 letter criticizing OMB’s Office of Information and Regulatory Affairs. “Currently, 84 of the 153 regulatory actions pending review at OIRA have been there longer than 90 days,” he wrote. The three long-in-process proposed rules Blumenthal singled out as most threatening to health and safety are an Occupational Safety and Health Administration plan to protect workers from inhaling toxic silica dust (814 days under review); a Transportation Department rule intended to expand visibility in and around cars to protect children from being backed over by vehicles (539 days); and a Food and Drug Administration proposal to limit the amount of arsenic in consumer-level containers of apple and grape juice. He asked Burwell to estimate the completion dates for pending regulations and report them publicly, especially when the cost-benefit analysis requires more than 90 days. “Undue delay in the rulemaking process poses costs on the public, creates uncertainty in the industry, and reflects poorly on OIRA’s role in the regulatory process by giving the impression that life-saving public policy is being bottled up for political reasons or due to pressure from special interests,” he wrote. OIRA has been under an acting director since Cass Sunstein left last August. Obama has nominated Federal Trade Commission economist and law professor Howard Shelanski for the post. 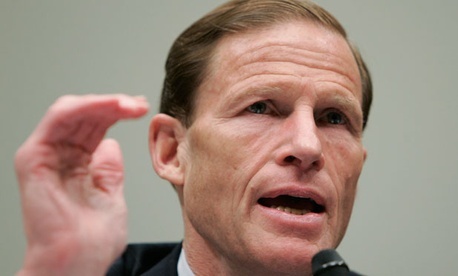 Katie Greenhaw, a regulatory policy analyst with the Center for Effective Government (formerly OMB Watch), said “it is significant that Sen. Blumenthal, as chair of the Judiciary oversight subcommittee, is raising in a formal way the concerns that worker safety and public interest groups have been raising for a while. It rightly gets at the real impacts of these delays.” The letter’s timing, she added, is also significant given the new team assembling at OMB.